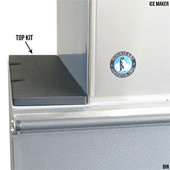 Hoshizaki Top Kits are smart kits to secure Hoshizaki Ice Machine placements over the Ice Bins. Different kits, with varying widths (4”, 8”, 14”, 22” & KMD Kit), are compatible with different models. It is suggested to purchase a Hoshizaki Top kit whenever your ice bin is wider than your ice machine. Please contact us if you have any questions.